Our NHL Wins Pool is free, easy, and incredibly entertaining. One of our greatest office pools. Draft several NHL teams and sum their wins to determine your points for the pool. 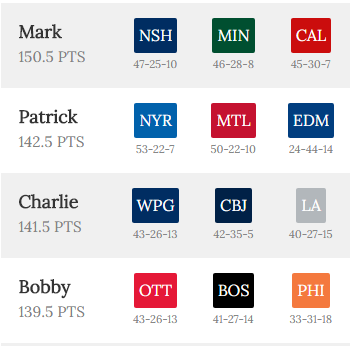 Whoever has the most points at the end of the NHL season wins. It’s great to have 5 or more teams whose games you can track day in and day out throughout the season. For this reason, I like to draft my NHL Wins Pools with a group of 6 friends who also choose 5 teams. Your pool can be configured to your liking, though. If you prefer to go one on one against a friend or coworker each of you could draft between 2 and 15 teams and sum their wins. As with all other Easy Office Pools, your NHL Wins Pool is hands free after your initial draft. No maintaining your lineup. No hassling your friends or coworkers to signup for a username and password. The commissioner simply configures the initial team selections and shares the web link for your personalized pool. This allows your pool participants to track the standings as games are won and lost without having to worry about lineup upkeep. Just sit back and enjoy the entire NHL season and all of the fabulous entertainment it has to offer! Configure your pool on Easy Office Pools Create Pool page. Please leave a comment if you’ve enjoyed a NHL Wins Pool yourself and can share any tips or tricks on how to make the draft enjoyable. Any chance this can be set up for the NHL playoffs? Manage Your PGA Golf Pool Online. Setup Your 2019 Home Run Derby Pool Online. We build custom fantasy sports formats that allow sports lovers to create and manage office pools online. Contact us at easyofficepools@gmail.com with your office pool ideas.